RESPECT. Interview: Angela Yee Talks Campaign With AMP ENERGY Organic In Search Of Ultimate Side Hustler | RESPECT. Radio Personality, Angela Yee has teamed up with AMP Energy Organic to launch a campaign to search for America’s most unique side hustlers. This is aimed towards those changing the food, fashion, beauty, art and music game. From for-hire mermaids and professional cuddlers, to Instagram influencers who post for brands in their free time… the contest is sure to attract the serious and ridiculous. Five lucky finalists will then be flown to New York to showcase their product or service at Powerhouse NYC 2018 in front of Hip-Hop and R&B’s top artists. The contest kicks off August 27, 2018 and will run through Sept. 16, 2018, with a national call for entries in the categories including food, fashion, beauty, art, or music. 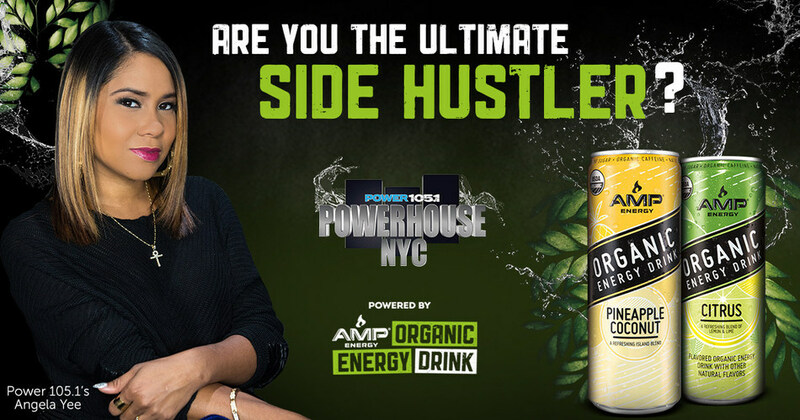 The online submissions will be evaluated by the AMP ENERGY® Organic team and Angela Yee, with five lucky finalists selected to showcase their product, experience or service at Power 105.1’s annual event, Powerhouse NYC 2018, attended by some of the biggest names in hip-hop and R&B, including this year’s headliners Cardi B, Lil Uzi Vert and G-Eazy. Don’t sweat the small stuff. Starting or growing a side hustle can be stressful when you think about everything that needs to happen to get it off the ground. Don’t let that deter you from getting started or realizing the potential of what the company could be. Set realistic goals and prioritize. Everything will come in time. Commit to a timeframe. I’m not talking about a “this has to be perfect by this date” kind of timeframe. What I mean is, dedicate a certain amount of time per week to working on your side hustle. It can be as much or as little as you’d like. If you want to dedicate five hours a week, great. If you want to dedicate 20 hours a week, that’s great too. Figure out what works best for you and your schedule, and have the discipline to stay on track. Never give up. Starting a business is tough, and I’d be lying if I said there aren’t going to be setbacks. Ignore the detractors and naysayers and, no matter how big or how small your goal, persevere and don’t give up. Rome wasn’t built in a day and not every idea will immediately take off. Stick with it and keep working hard, and you’ll see the payoff soon enough. Set yourself up for success. Do your research. Is there anyone else out there with the same idea or business model? How do you stand out or do what they do better? Being aware of what else is out there and differentiating yourself from the masses will give you succeed in the long run. Hustle the right way.Being an entrepreneur takes hustle. The problem is, many people think hustle is about becoming a workaholic. In reality, hustle is an act of focus. It’s not about doing more, it’s about concentrating on the things that you need to do, in order to move your business forward. To enter the contest, consumers can visit Power 105.1’s website to submit a text description that explains their side hustle and what makes it special. Photos and videos are also encouraged. Each entry will be judged on its originality and uniqueness, whether it represents a side hustle (idea, experience, service or good) that can be amplified in a larger way, and its overall connection to the AMP ENERGY® Organic brand. In addition to receiving two tickets to Power 105.1’s Powerhouse NYC 2018, free roundtrip airline tickets for them and a guest, and a hotel stay, each Grand Prize Winner will be awarded the opportunity to showcase his or her side hustle at Power 105.1’s Powerhouse NYC 2018 pre-event on October 24 and at the main show on October 28. 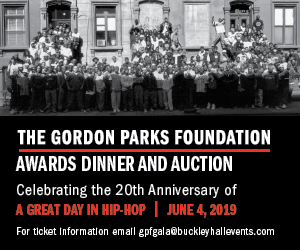 The five winners will also have the opportunity to have face time with Angela Yee for advice, and promote their business on Power 105.1’s channels. AMP ENERGY® Organic is also giving away tickets to Power 105.1’s Powerhouse NYC 2018 in-store and online, including airfare and a hotel stay for lucky winners and one guest. Visit your local AMP ENERGY® Organic retailer or Power 105.1’s website to enter to win tickets between September 10, 2018 and October 12, 2018. Check out our interview with one of the lead radio personalities in hip-hop below. RESPECT. : How did you feel when AMP reached out to do the campaign? Angela Yee: I though it was great it’s right up my alley, because I’m the queen of side hustle since I was young and I didn’t even realize I was side hustling. What are you looking for in someone that is America’s most side hustler? What is some advice you can give someone that’s an aspiring entrepreneur? First off, never feel like you can do it all by yourself. Because I think sometimes we have that mentality, like this is my idea and I have to do everything on my own. It’s been really important to me that either you are working with people that are supportive of you or consulting with you, bouncing ideas off of you or getting interns, or even having the budget to hire somebody, getting an investor, partnering up with somebody. For me doing the Juicebar, I had never done a Juicebar before. It was a no-brainier to me Styles-P and Jadakiss have their Juicebars and they’ve been successful. For me, I was like let me go approach them, I don’t mind giving up a piece of the pie of an idea I had if that pie is going to be way bigger. So to me I just said you know what I don’t even want to attempt to do this on my own, I’d rather partner up with somebody that has some experience + success and cares about the community and I went to their Juicebar and did my research, I really loved going there. I love the vibe of it, I liked the people that worked there they were really knowledgeable about the juices and that was really helpful. I’ve been to Juicebars where you might want to get a juice but don’t know what to get and you ask them and they don’t even know what to tell you. “Like I don’t know people like the strawberry banana smoothie” (laughs). So it was important to me when people say their are juices that are good for you when you have menstrual cramps, if you’re about to workout. All of those things are important to know sometimes people think juicing means you’re losing weight and they don’t know things that’ll make you gain weight some people want to gain weight. It’s just alot of different things that you have to take into consideration. I love the fact they were so knowledgeable if not just hiring somebody who needs a job and also educating them so they can speak with the customers and be knowledgeable. What is the biggest thing you’ve learned since you’ve started your own business? Being 5 minutes late can really throw somebodies day off, so that’s something that’s been important. People calling out sick that can disrupt the whole entire schedule for other people just being considerate of each other, it’s dealing with human beings and when you’re dealing with human beings theirs issues all the time. So just tell them to make sure you get the right group of people. It’s a Juicebar we want people to come in and feel good.